The Columbia Series 2500 Imperial aluminum sliding patio doors redefines standards in the industry of patio doors. This thermal break door brings energy efficiency, solidity and security. Our door is a superior product for either new construction or renovation projects. General: The Columbia 2500 Imperial Aluminum Sliding Patio Door and 2500 TBR Aluminum Sliding Patio Doors shall meet or exceed the ANSI/AAMA 101-85 specification requirements for SGD-C20. Material: Sliding door frame and vent sections shall be aluminum alloy and temper 6063-T5. Component parts and accessories shall be stainless steel, aluminum, or other corrosion resistant materials. Finish: For maximum resistance to corrosion sliding door frame and vent sections shall be painted bronze or white acrylic electrostatic enamel finish as specifiec. Construction: All joints of the frame and vent sections shall be neatly fitted and secured to fully utilize the strength of the members and provide permanent watertight joints. Both sliding and fixed panels shall be constructed so that the location and direction of the slide for the panels can be changed after installation without replacement or reglazing. The sliding panel when in a locked position shall not be removable from the outside. Both sliding and fixed panels shall be removable for glazing and maintenance. The sliding panel shall be equipped with ball-bearing bottom-rolling type adjustable sheaves at each end to allow for proper alignment of the sliding vent with the frame. The sheaves shall be adjustable without removing sliding vent. The threshold shall have a removable stainless steel track to provide ease of operation and lasting quality. Weatherstripping: Columbia uses a full perimeter double weatherstripping on both the frame and panels to insure a positive seal. The weatherstripping shall be a high performance poly bond fin seal. Hardware: The hardware used on Columbia’s aluminum sliding glass doors shall be of a non-corrosive material. The sliding vent panel shall be equipped with a deluxe handle and non-jamming clam latch system utilizing the door frame as the strike, thus eliminating a weak link in the security chain. The clam latch will not permit the sliding vent to be locked automatically or permit damage to the lock if the sliding vent is closed with the latch in a locked position. The outside pull and latch shall be easily adaptable for a cylinder lock, when specified (available at extra cost). Glazing: All glass will be tempered (safety) glass. 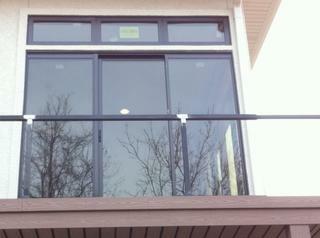 All doors shall be glazed with 1″ dual or triple insulated glass as specified. The glass is set in a wrap-around vinyl glazing channel with welded corners. Screens: Screens shall be extruded hollow aluminum fitted with 18×16 fiberglass screen cloth or mesh aluminum wire (available at extra cost). The screens shall be furnished with four tension mounted ball bearing rollers, interior and exterior pulls, or handle and latching device. Screen shall also have vinyl insect-proofing at the interlocking stiles. Erection: (included under another contract) These aluminum sliding doors shall be erected in prepared openings according to manufacturer’s instructions. All door frames shall be installed plumb, level, and square to allow proper functioning in regard to sliding, locking and weathering. All necessary screws shall be furnished by manufacturer. Certification: Columbia’s 2500 Imperial Aluminum sliding patio doors shall conform to all requirements of the AAMA Certification Program. Guarantee: The sliding patio doors and components as represented are unconditionally guaranteed against defective material or workmanship for one year provided that the installation is in accordance with the manufacturer’s specifications and instructions.